Lisbon, OH - "...Bova will repave a 1.5-mile section of the bicycle trail between Franklin Square and Leetonia in an area known as the wetlands. First paved in 2004 and 2005, this section has a numbers of areas that have heaved up and cracked over the years. Lisbon, OH - "The county Park District has received a federal grant of up to $682,323 to extend the Little Beaver Greenway Trail three miles to the Day’s Inn, filling in a key piece in a regional plan to create a bike trail from Lake Erie to the Ohio River. 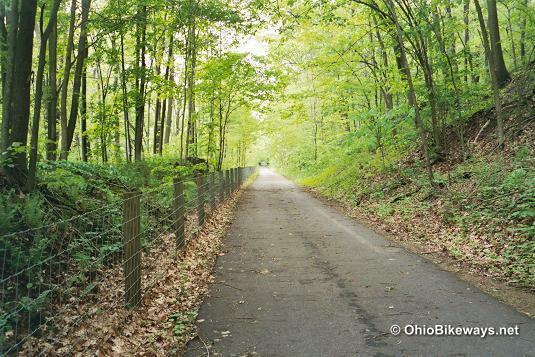 From morningjournalnews.com, "The Columbiana County Park District has been awarded a $142,860 grant by the Ohio Department of Natural Resources to repave part of the Greenway Bicycle Trail. "District Chairwoman Dottie Betz said that work on the trail improvement could start as early as next year. The section to be repaved is between Leetonia and Franklin Square, a distance of just over a mile." From salemnews.net, "...The district has applied for a grant from the Ohio Department of Transportation that would pave pay for the construction of a three-mile trail extension - featuring a short bridge - to the Day's Inn. "'The trail would run along the north side of State Route 154, where we have an easement,' Betz said. Cyclists and hikers would connect from the current village trailhead by using Lisbon's streets to Moore Street where the extension would begin. "...Betz also said that the district has also applied for another grant that would repave the trail between Franklin Square and Leetonia. The state recently contacted Betz for more information, giving her hope that the district could receive the money." Leetonia, OH - The ribbon cutting for a new 25-acre park alongside the Little Beaver Creek Trail took place last Thursday. The park is a link between the trail and the historic coke ovens. It includes a paved trailhead and a walking trail. From reviewonline.com, "The Columbiana County Park District is working with the Western Reserve Land Conservancy to acquire 30 acres near the Franklin Square area of the Little Beaver Creek Greenway Trail. "...the property is located just south of Franklin Square where the bike trail crosses Lisbon Road and actually abuts all four corners of the intersection. The WRLC has been in talks with the property owner, who is interested in selling, and the park board agreed to provide the matching funds necessary to qualify for the grant and take ownership of the property if the grant is awarded." Facilities: Restrooms at several locations, along with at least 2 water stops, in-season. Worth Noting: This trail is a part of the 100-mile GOLTRG network. The GOLTRG will extend from Lake Erie in Ashtabula, south to a point near East Liverpool along the Pennsylvania border. The projected length of the trail (when completed) is between 100 to 110 miles. We parked at the Eagleton Road Trailhead, near 411. This lot is near a small covered bridge, which lies north of the trail along Eagleton Road. Our goal was to park near the middle of the trail, but we don't recommend this location. It was difficult to find. The Little Beaver Trail extends through a watershed area under a canopy of trees. This ensures your ride will be cool and comfortable, even on hot summer days. The water trickling down from a hillside above created small wet spots here and there along the asphalt trail surface. Though it had not rained during our ride, runoff from the previous night's rain was slowly working its way down to the creek on the valley floor below. We saw an owl under the darkened tree canopy. I can't say that I've ever seen one outdoors during the day, so this was certainly a treat for me. Though this bikeway is a rail-trail, it does have elevation gain. The trail gently rises and falls for much of its length as it makes its way along from Lisbon to Leetonia. How gentle is the grade? Well, I suppose that depends on one's fitness. On our tandem the grades near the middle of the bikeway didn't feel subtle. We worked noticeably harder on the climb and reaped the benefits of gravity on the descent. As you ride closer to Lisbon, the trail takes a 1/2 mile detour over the road. There was no traffic during our ride, and the trail connections were clearly marked. As the trail enters Lisbon, it briefly slices through a residential area before ending. The trail travels briefly alongside a wetland and an active railroad line which it follows into southern Leetonia. Since our visit, the trail has been extended north to Washingtonville. But you'll have to do a mile of road riding through Leetonia to reach the next 1.5 mile trail segment. The remaining gap to connect with the Mill Creek Bikeway to the north is ~6 miles. 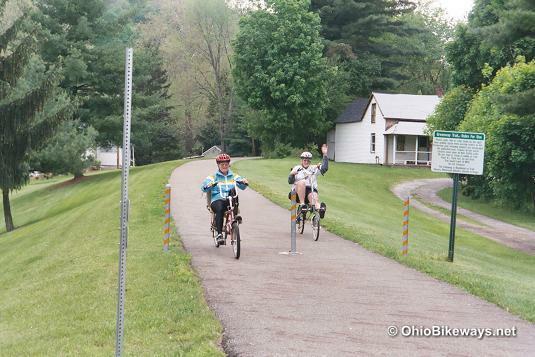 Both bikeways are part of the larger Great-Ohio-Lake-to-River Greenway.